When the Metamorphosis team of content coaches meet at their New York office, the day is filled with Qi Gong, video case analysis, good food, and—best of all—a mathematical challenge for everyone to investigate and discuss. These problems are chosen to be accessible across a wide range of grade levels and to allow for a variety of solution approaches. Metamorphosis coaches think deeply about students’ mathematical reasoning, and what better way to become more reflective than to analyze their own problem-solving strategies? A recent meeting of the coaches featured the following problem: What is the perimeter of the polygon below? There was certainly a big tug towards algebra when solving this problem, but it does allow for purely geometric solutions as well. 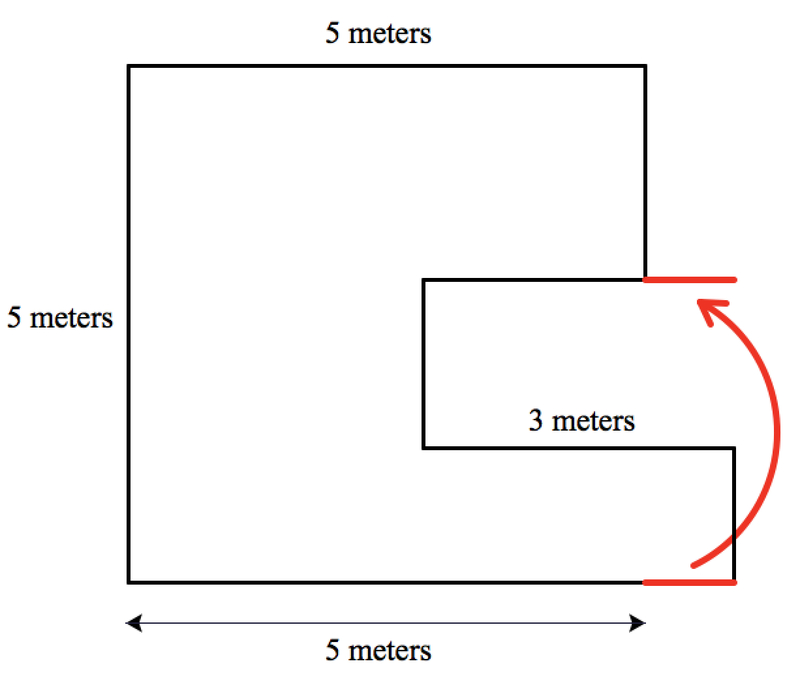 In the illustration below, the 5-meter and 3-meter lengths (displayed in red) are translated straight down. We see that taken together, the sum of the two red sides is equal to the sum of the two blue sides. Thus the sum of the polygon’s horizontal lengths is 16 meters. Another way to think geometrically about the situation is to divide the lower polygon side into a 5-meter length and an extra length shaded in red. By moving this red length up, we see that horizontal sides now all have known lengths: 5 + 3 + 3 + 5, moving from top to bottom. 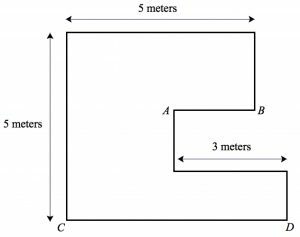 As a more concrete approach, we can assign a length to segment AB below and use that information to determine the length of CD. 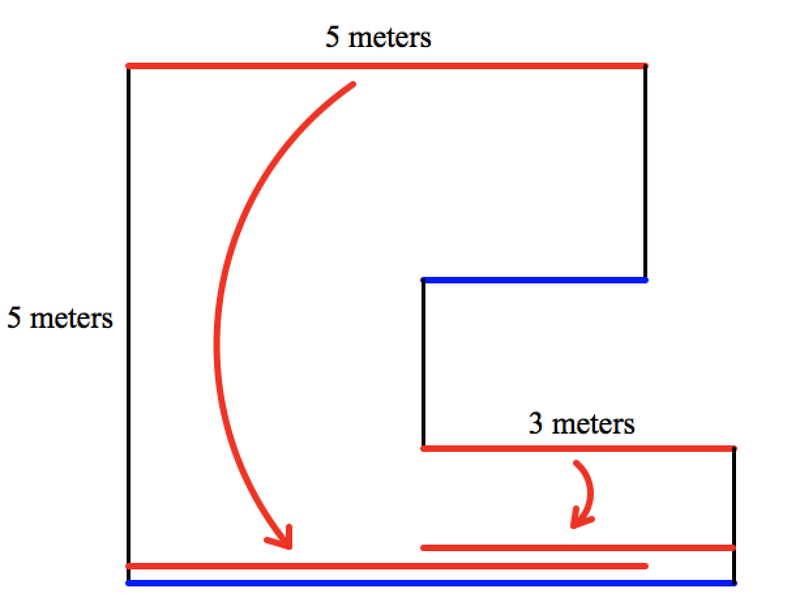 For example, if AB = 1 meter, then CD = 7 meters. 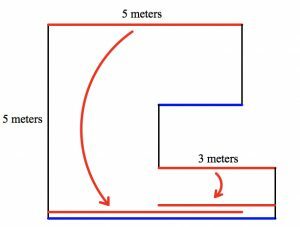 If AB = 1.5 meters, then CD = 6.5 meters. 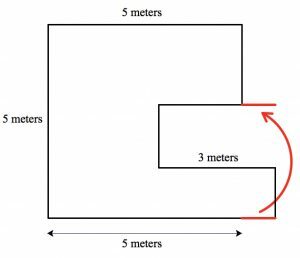 And if AB = 2 meters, then CD = 6 meters. 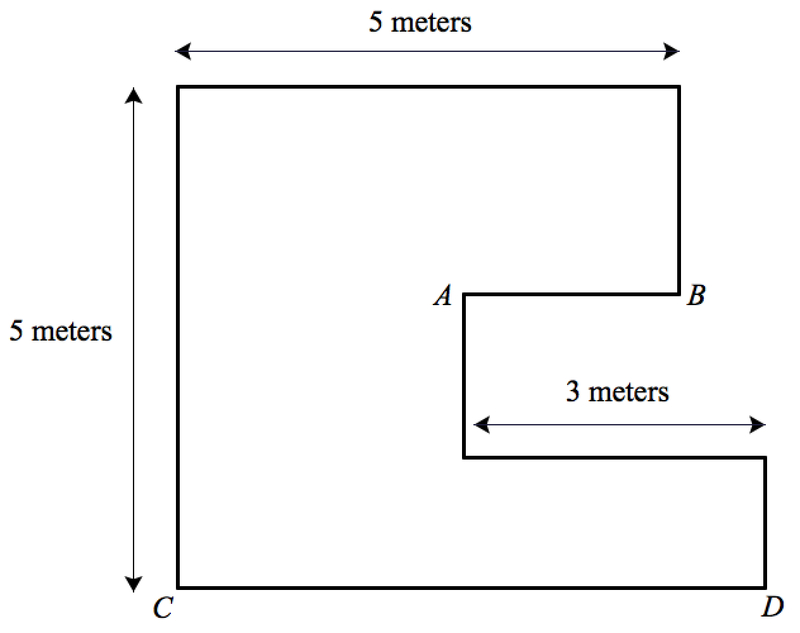 In all three cases, the sum of AB and CD is 8 meters. While these numerical values in themselves don’t explain why the sum of lengths AB and CD should be constant, they do alert us to a mathematical pattern that we can then try to explain. We can also examine the extreme cases. 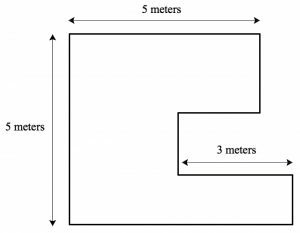 In the top illustration below, I’ve made the length of segment AB just a smidgen less than 3 meters, so for all intents and purposes, the four horizontal segments have lengths of 5, 3, 3, and 5. 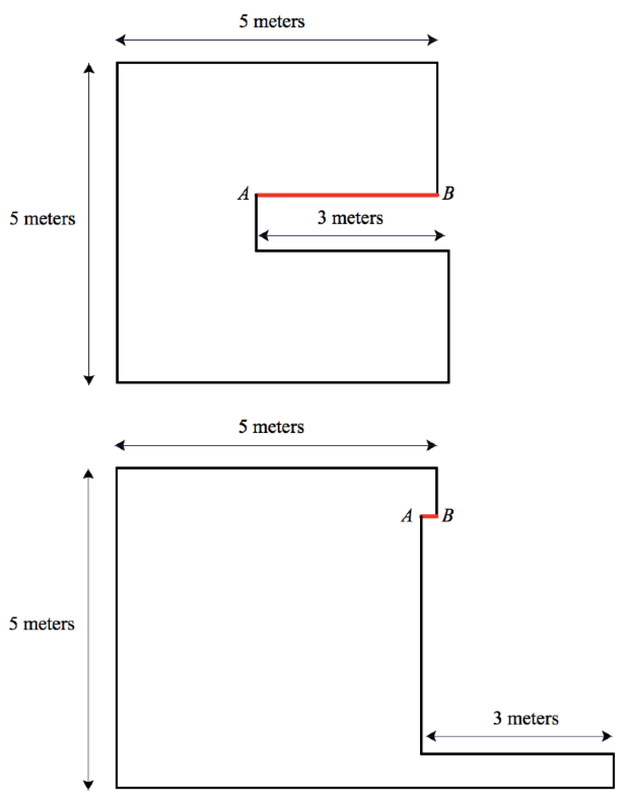 And in the bottom illustration, I’ve made the length of AB nearly 0, so the lengths of the three remaining horizontal segments are 5, 3, and (nearly) 8. 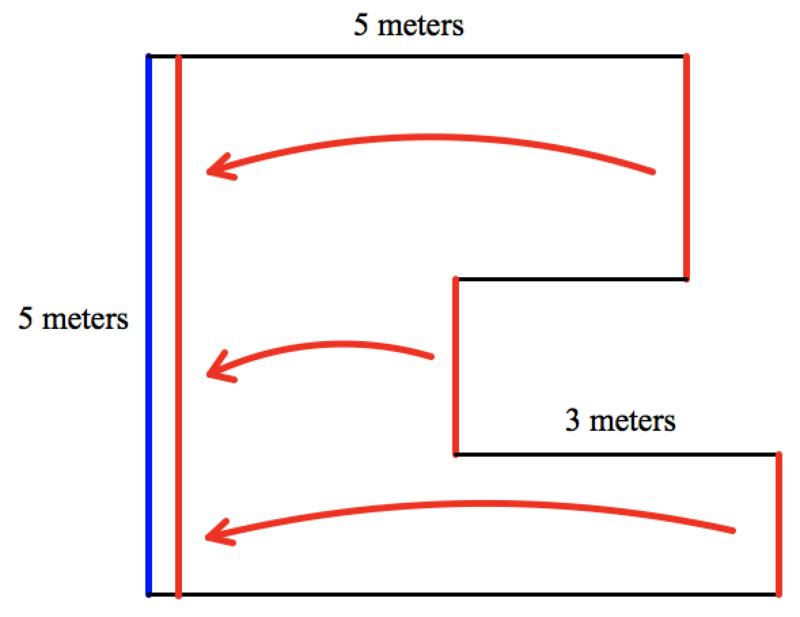 In both extreme cases, the sum of the horizontal lengths is 16 meters. 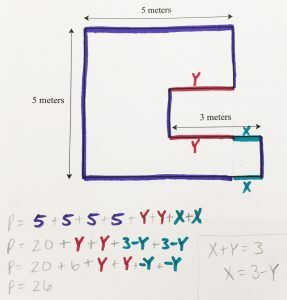 How do students in your class, whether it be third grade or high-school geometry, think about and solve this problem? Let us know! Love this blog, Daniel. Thanks for posting. using color, helped me see things I didn’t see the first time around! 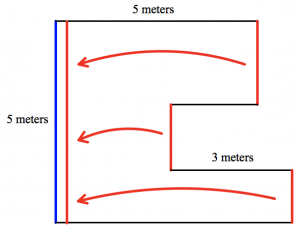 I imagine that I am walking around the perimeter of the polygon in the clockwise direction. During the trip, I travel 8 meters east and 5 meters north, so I must also travel 8 meters west and 5 meters south to return to where I started. So the total distance is 8 + 5 + 8 + 5 = 26 meters. I like your approach, David–so simple!